The site for An Camas Mòr is not a Capercaillie habitat. Beyond the site, at a distance of one kilometre separated by two roads, two fields, woods and a deer fence from the site, there are Capercaillie habitats. scientific evidence indicates that significant disturbance to Capercaillie near recreational routes can be reduced if people and dogs stay on the route. Promoting The Scottish Outdoor Access Code, and following its ‘practical guide’ for ‘Nature Reserves and Conservation Areas’ is proving an effective way to meet the conservation aims for Capercaillie. Rothiemurchus is probably one of the most visited areas of the CNP (c.300, 000 visitors per annum, Robinson and Scott (2013)) yet they have one of the best capercaillie populations in the UK. The plans for An Camas Mòr will result in an overall increase in the habitat for Capercaillie. An Camas Mòr is planning a vision for people’s enjoyment of the outdoors as part of the ‘Recreation Management Plan’ that we must submit to meet the planning conditions. This is an opportunity to tell us about the new recreational facilities that you wish for in the area. The ‘Recreation Management Plan’ will be a robust plan which demonstrates that An Camas Mòr can meet the aim set out in the Cairngorms National Park Authority’s Habitats Regulations Assessment that there should be no effect on the integrity of any Natura sites. The formal consultation process will be agreed with the Cairngorms National Park Authority- but we have been informally asking people for their views at facebook . In response to misreporting, we must state that ‘The Habitats regulations Assessment’ is solely the Cairngorms National Park Authority’s legal responsibility. An Camas Mòr was not consulted on the inclusion of byelaws. We believe that in order to best protect rare species, we must arrive at a consensus, together as a community, because this is likely to be the most effective way of making sure people do the right thing to conserve our wildlife. What we see other people doing, who we come into contact with, how people feel about wildlife and what their friends think is the right thing to do are also among the main causes of what people actually do. It is strongly in our collective interest to do the right things to conserve our natural heritage. Our local economy depends on people coming here to appreciate and enjoy it and we are all proud to take care of the forest and its’ wildlife. The design for An Camas Mòr was shaped by the architects in collaboration with the community, at a series of public meetings between 2005 and 2009. The community’s wishes included ‘back garden nature reserves’ and ‘keep the trees’ ‘less dependence on cars’ ‘biking’ and ‘walk to work’. The vision is for a village in the woods based on a traditional Badenoch and Strathspey village, where people can enjoy a connection to nature. Home, work school, the shops and the forest will all be within five minutes walk for a more sustainable and affordable way of life. The village will have ‘biostrips’ ‘green crossings’ and ‘wedges of trees’ coming into the village centre- so residents will experience daily encounters with nature and enjoy the benefits on health and wellbeing. If people feel a connection to nature, they will be inspired to look after it. This way, the design can make a positive contribution to successfully meeting the conservation aims that come part and parcel of living in a special area with rare species of wildlife. What do Capercaillie have to do with An Camas Mòr, if there are no birds at the site? The site for An Camas Mòr is not a Capercaillie habitat. Beyond the site, at a distance of at a distance of one kilometre separated by two roads, two fields, woods and a deer fence from the site, there are Capercaillie habitats. The Planning Permission in Principle for An Camas Mòr was approved on the condition that there will be no significant effect on Natura sites, where there are Capercaillie. It is possible that residents from An Camas Mòr will visit these Natura sites. An Camas Mòr is required to carry out an appropriate assessment to prove that residents from An Camas Mòr will not carry out certain kinds of activities that will harm the conservation aim to protect Capercaillie whilst on recreational visits. The Cairngorms National Park Visitor Survey found that 94 out of every 100 visits to the countryside in the National Park are from people who live outside the Park’s boundaries. Locals are such a small minority of recreational users that our visits to the countryside will have a minor marginal effect on the overall numbers of people visiting Natura sites. A number of different things will change visitor numbers to the countryside over the next 30 years- for example, the fall in the value of the pound is likely to attract more tourists- people who live at An Camas Mòr will always be few in comparison. Scientific research into Capercaillie finds that certain kinds of activity in Capercaillie habitats are associated with a loss of territory. recreation in the breeding season. Observations of where droppings are found suggest that capercaillie avoid areas near carparks and within 50m of paths. Chemical analysis of droppings suggests that birds are stressed by off-path activity, be it dogs or people skiing, cycling or walking. So, fragmenting a forest by creating new paths in relatively undisturbed areas is regarded as not good for capercaillie. But the scientific evidence also shows we can take steps to protect our wildlife: All wildlife benefits from good dog control, and dogs and people keeping to regularly used paths, with screening and sufficient habitat between paths for wildlife. Significant disturbance to Capercaillie near recreational routes can be reduced if people and dogs stay on the route. Significant disturbance to capercaillie near recreational routes can be reduced by developing effective visual and noise screens e.g. through vegetation growth, topographic barriers etc (Thiel 2007). ‘The Glenmore example shows that Scottish woods with sufficiently large trackless compartments can sustain Capercaillie if people and dogs keep largely to tracks’ (Moss et al. 2014). Glenmore has a higher volume of recreational users than other Capercaillie habitats such as Abernethy- which proves that the forest can sustain where there are a high number of recreational users. There is no scientific evidence to support the theory that the overall volume of recreational users in a particular area (such as Glenmore) is a relevant factor in managing land for the conservation of Capercaillie. It is important to Capercaillie that Land managers and recreational users take the right steps to create an area of ‘refuge’ for Capercaillie and thereby meet the conservation aims, the overall numbers of people are an unimportant factor in achieving this aim. Providing information on the importance of the site and on the best routes for people to follow, and providing good paths, can help to minimise damage and disturbance, and increase public awareness of wildlife. Access rights extend to these places but remember that they are carefully managed for nature conservation and to safeguard rare animals and plants. Take care to avoid damaging the site or disturbing its wildlife, or interfering with its management or enjoyment by others. Depending on your activity, you might be requested to follow a specific route or to avoid exercising access rights in a specific area: following such local guidance can help to safeguard the natural heritage of these areas’. How is the Scottish Outdoor Access Code already applied to help safeguard Capercaillie? To ensure that people in the countryside care for its wildlife, there are existing measures in place that fall within the scope of the Scottish Outdoor Access Code and are proving effective. • Providing well-maintained paths in the most beautiful places and on convenient routes. • Providing guidelines, with signs and leaflets, on how to follow the Scottish Outdoor Access Code in Nature reserves and other conservation areas. • Educating children by taking them into the forest on school trips, and teaching them about local wildlife. Taking ‘care for the environment’ is a core ‘Principle’ of the Scottish Outdoor Access Code. By promoting people’s enjoyment of the outdoors, we can increase awareness of nature. People don’t want to harm wildlife and they will take the right steps to avoid doing so if they are properly explained. Why will the plans for An Camas Mòr result in an overall increase in the habitat for Capercaillie? The site for An Camas Mòr is not a Capercaillie habitat but to compensate for any loss of woodland, there will be an area of woodland set aside for the natural regeneration of pine trees, and this area will be a suitable habitat for Capercaillie, and is already adjacent to an existing Capercaillie habitat. The compensation habitat is towards the Lairig Ghru pass (pictured above). If you are currently living in Aviemore, you will have new paths on the other side of the River Spey, that you can get to without a car or crossing the A9, in the future extended Aviemore Countryside Park. There are also likely to be more signs giving information about Capercaillie, like those already in place. 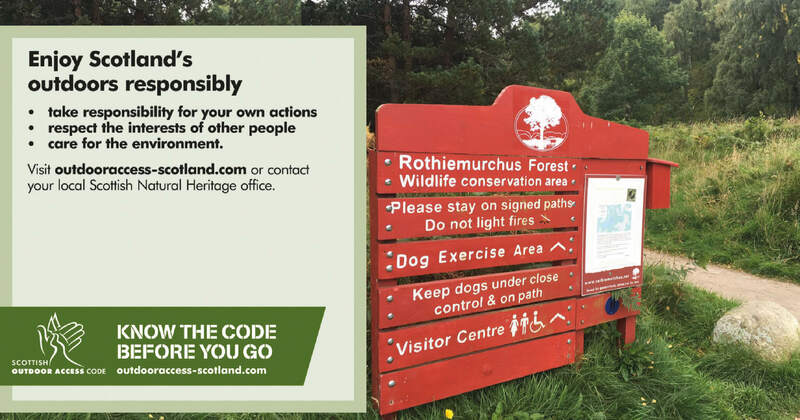 These signs give guidance on how to enjoy the outdoors responsibly, and protect the species by following the Scottish Outdoor Access code: these are necessary with or without An Camas Mòr because 94 out of every 100 recreational users are from outside the National Park. Land managers will manage the woodland to increase the forest understory- this screens the Capercaillie from the noise and sight of outdoor visitors, and thereby protects them from human disturbance. Land Managers are already encouraged to do this by the Scottish Rural Development Programme to enhance the biodiversity of Capercaillie habitat.